Taking a ride on a steam train is always a delight, it’s a lot like being gently transported back in time to a different era. So it was with sadness I read the other day that the Zig Zag Railway in the Blue Mountains was to close. Recently the Zig Zag team have only been offering the diesel rail motor train; that’s now almost old enough to be exciting, but it’s just not the same as a steam train ride. That’s a downward spiral right there. The Zig Zag Railway has always been particularly good. 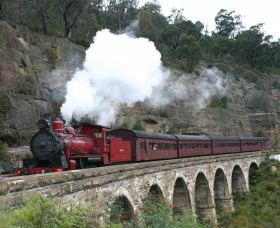 Not only is there a steam train but it’s in the Blue Mountains and runs over a set of wonderful sandstone viaducts. For a full-on steam experience you can combine the Zig Zag with a visit to the Valley Heights Locomotive Depot Museum where, if you are lucky, you can actually ride on the boiler plate and make the locomotive’s whistle go. The Zig Zag is run by a group of volunteers and apparently they were running out of money and skills to keep the trains running. My train-geek friend in the Blue Mountains reckons the problem was really with Government regulations. So it was good today to see NSW Transport Minister Gladys Berejiklian say the government would provide expertise to help address safety concerns. The Zig Zag Railway holds a special place in the hearts of many in NSW, and I have instructed Transport for NSW to provide its expertise to the organisation to see if it can meet the necessary safety obligations. That doesn’t mean the railway is saved, it’s by no means full-steam ahead, but it’s a step in the right direction. Unless something changes the last train will run on the Zig Zag Railway on 17 June.